Late December is not an appealing time of the year to go outside for a walk. The days are very short and the weather is often overcast, taking away even more light. Snow is rare and the scenery therefore mostly brown and gray. I still feel that it is worth getting outside and enjoy nature as it is during this part of our yearly cycle. Some things are even more noticeable when everything around is somewhat dull. The colorful road-side shrine was one of those. Between all the trees and bushes without their leaves, it really stood out and caught my attention. It was a large shrine and obviously well maintained. Fresh heather was planted in the pots. The ground in front of the shrine was covered with bark mulch and the roof recently modernized. A large statue of Maria holding a rosary between her folded hands looked at me. “Ave Maria” – Hail Mary! Stepping closer, I could read the inscription at the base. This road-side shrine has a direct relationship with the road itself – the Via Regia. It commemorates the life of Lisa Götte, a girl who was run over by a car at the very spot the shrine was built. Without trivializing devastating accidents like this, building shrines as a result of fatal traffic accidents is somewhat unusual. Here and there you can see see small, wooden wayside crosses with a lantern next to it on German roads. Often, these mark sites, where young people died in traffic. They are mostly temporarily and are removed or forgotten after some time. A certain acceptance of the risks from modern traffic however has evolved in our society. 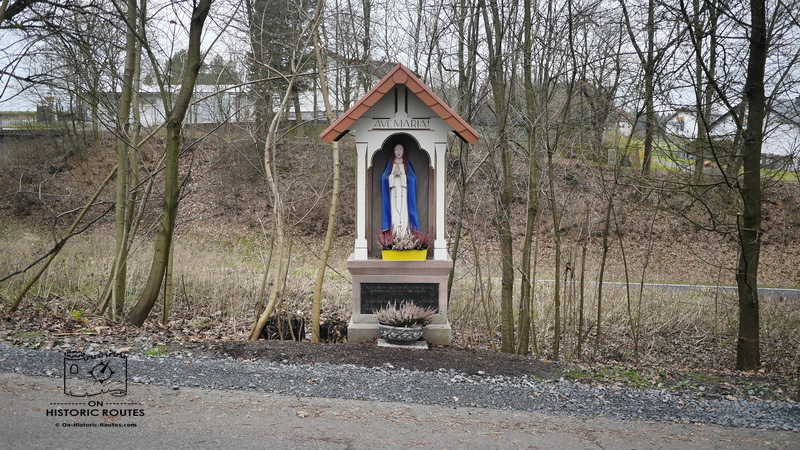 This might well be the reason for the colorful shrine that I came across on the Via Regia near Fulda. Lisa was on her way to school in the summer of 1948, when she was hit by a car. Car traffic was just emerging in rural Germany during that time and accidents not that common. The tragic death of the girl shortly after the end of the Second World War was reason enough to build the shrine and maintain it for now almost 70 years. That while in the midst of Life, you are surrounded by Death.